While Harvey Specter (Gabriel Macht) and Mike Ross (Patrick J. Adams) try to win cases for their clients, USA is hoping Suits will continue to win over audiences and bring in big ratings. The TV show’s cast also includes Gina Torres, Meghan Markle, and Rick Hoffman. Below are the most recent ratings for Suits on USA. The TV show’s ratings are the best way to tell if it will be cancelled or renewed for a third season. The second season of Suits airs on Thursday nights and there are 16 episodes. Final season averages: 1.2 rating in the 18-49 demographic with 3.60 million total viewers. 1.0 demo rating (0% change) with 3.20 million (+11% change). Season averages: 1.17 in the demo with 3.60 million. 1.0 demo rating (0% change) with 2.90 million (-5% change). Season averages: 1.18 in the demo with 3.63 million. 1.0 demo rating (0% change) with 3.07 million (-9% change). Season averages: 1.19 in the demo with 3.68 million. 1.0 demo rating (-9% change) with 3.36 million (-10% change). Season averages: 1.21 in the demo with 3.73 million. 1.1 demo rating (-8% change) with 3.75 million (+5% change). Season averages: 1.23 in the demo with 3.76 million. 1.2 demo rating (-20% change) with 3.57 million (-20% change). Season averages: 1.24 in the demo with 3.76 million. 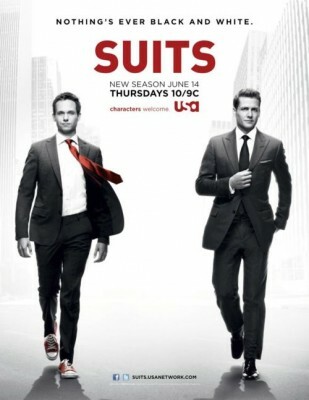 UPDATE: Suits returns January 17, 2013 and has been renewed for a third season. 1.5 demo rating (+7% change) with 4.48 million (+12% change). Season averages: 1.24 in the demo with 3.78 million. 1.4 demo rating (+27% change) with 4.00 million (+17% change). Season averages: 1.21 in the demo with 3.70 million. 1.1 demo rating (-8% change) with 3.42 million (0% change). Season averages: 1.19 in the demo with 3.66 million. 1.2 demo rating (0% change) with 3.41 million (-12% change). 1.2 demo rating (0% change) with 3.89 million (+4% change). Season averages: 1.20 in the demo with 3.75 million. 1.2 demo rating (0% change) with 3.73 million (+1% change). Season averages: 1.20 in the demo with 3.72 million. 1.2 demo rating (-8% change) with 3.70 million (-5% change). 1.3 demo rating (+8% change) with 3.88 million (+2% change). 1.2 demo rating (+9% change) with 3.80 million (+10% change). Season averages: 1.15 in the demo with 3.64 million. 1.1 rating in the 18-49 demographic with 3.47 million total viewers. Season average: 1.10 in the demo with 3.47 million. Reference point: The first season of Suits averaged a 1.4 rating in the 18-49 demographic with 4.28 million total viewers. What do you think? Do you still like the Suits TV series? Are you hoping that it’s renewed for a third season? Love the show. Do not like the use of G__ D__. I find it unless art and unnecessary. on a fleeting unreasearchdd detail that may or may not be relevant to winning. use internet for that purpose, and get the hottest news. I love the show. I hope it goes on longer than Dallas or Bonanza. I love Suits! It’s one of my favorite programmes! Don’t cancel it… Please… ? Please continue this show. EXCELLENT WRITING AND ACTING !! ONE OF THE BEST SERIES ON TV. I TELL EVERYONE TO WATCH IT !!! MY GRANDSON IS GRADUATING FROM LAW SCHOOL THIS SPRING AND I WANT TO BUY THE SET OF SUIT’S DVD’S FOR HIM. I KNOW HE WILL LOVE IT. Does anyone know if there is a fan club for Rick Hoffman? I love the scenes when he is talking about the cat. What brilliant writer or writers thought that foul and vulgar language would enhance the already great show ratings. I have watch my last show due to the despicable foul mouth comments that comes from the actors mouths. Suits is the best written show on TV. Love the cast – especially the relationship between Harvey and Mike. Great show!! Would love to see more shows added to the season. I love the show. Characters are believable and real. Excellent writing and acting! Looking forward to the next season! Love the show. I agree , the foul language is not necessary. One of the best shows I have seen in a long time. Great show except when it’s obvious that they’re walking around Toronto instead of New York. Also not keen on the language this season, why bother? I’m watching in Ireland we’re a few episodes behind but it’s one of the best US imports on TV right now.